Look for the Matebook 13 to be one of the early Whiskey Lake notebooks. Just a few cut corners diminished Huawei’s Matebook X Pro 14-inch flagship notebook. 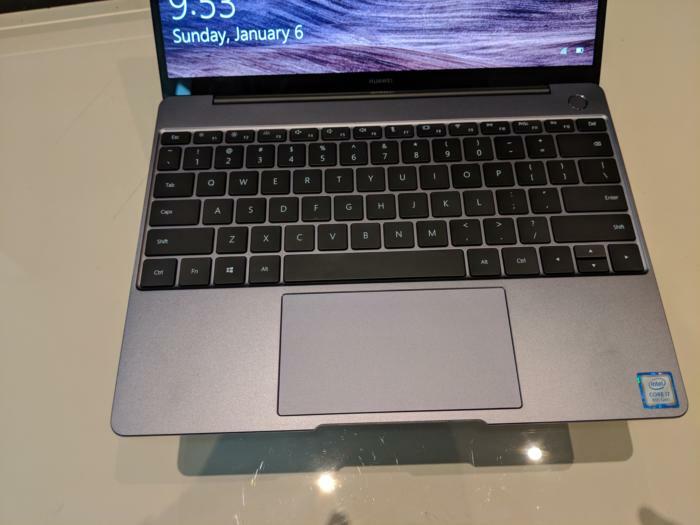 The smaller, less expensive Huawei Matebook 13 appears to have solved some of these flaws, while still keeping the best features of Huawei’s premium device, including a discrete GPU. It’s also one of the first notebooks out of the gate to include Intel’s “Whiskey Lake” Core chips. We’ve been continually impressed with the ability of Chinese hardware makers to deliver premium hardware at affordable prices, and the Matebook 13 demonstrates this: Its high-end Core i7-8565U Whiskey Lake chip is paired with an Nvidia GeForce MX 150 (the same GPU as on the Matebook X Pro) for just $1,299. A Core i5-8265U model is also offered for $999, but with integrated graphics. Both are shipping to U.S. customers in early 2019. Enormous keys and an equally mammoth touchpad are one of the strengths of the Huawei hardware. 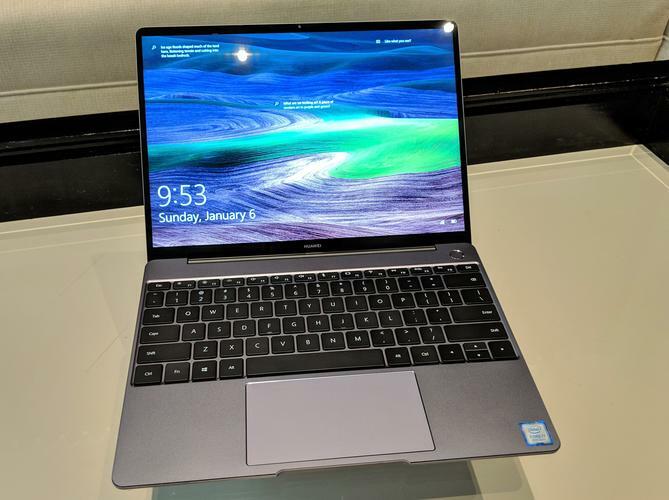 At a briefing at CES 2019 here in Las Vegas, Huawei described the Matebook 13 as a step down from the Matebook X Pro, but there’s still a lot to like in this compact 13-inch notebook. The first impression is one of solidity: At 2.82 pounds, it’s a bit heavier than you’d expect, but the added weight gives the notebook a sturdy feel. Huawei engineered the Matebook 13 out of an aluminum alloy, chamfered the edges, and finished it off with a sandblast process that gives the surface a bit of grip. The Matebook 13 is a traditional laptop, so it doesn’t fully recline to flat, let alone 360 degrees. We didn’t notice any wiggle in the display or flex in the keyboard, though—again, this feels like a solid little machine. And “little” it is. Two words that we’re hearing more and more already are “footprint” and “screen to body ratio.” On the latter, this laptop is packing a 13-inch, 1440p screen (with 300 nits of brightness and a 3:2 ratio reminiscent of the Microsoft Surface devices, plus 100 percent sRGB color accuracy) with a screen-to-body ratio of 88 percent. 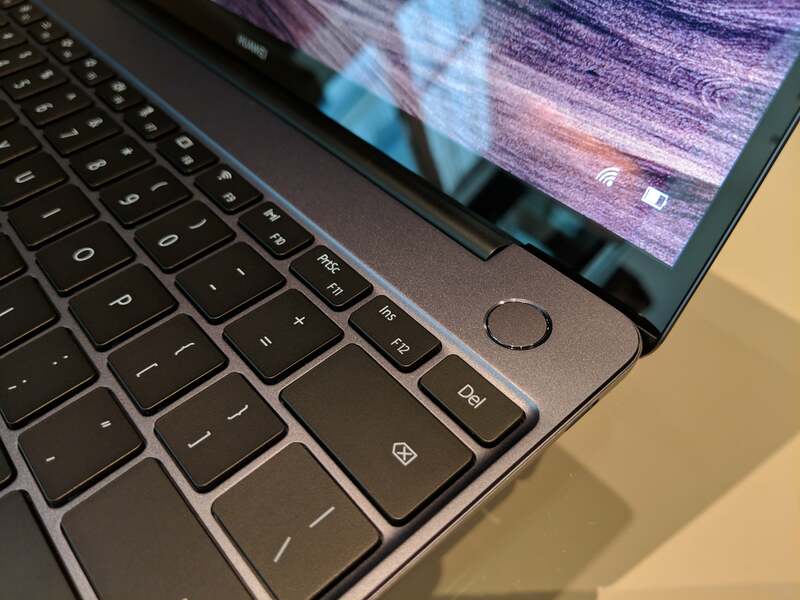 The Matebook 13 is just 11.26 inches across—the message that Huawei’s trying to deliver is that the Matebook 13 is essentially a 13-inch notebook within a 12-inch chassis. The power button still doubles as a fingerprint reader. Some of the features we liked within the Matebook X Pro remain: the power button that doubles as a fingerprint reader, for example. The size of Huawei’s keys are typically larger than most, and on the smaller chassis they simply appear massive, with 1.2mm of travel that’s just a bit shallow. The trackpad, too, remains equally enormous, though Huawei said its improved the responsiveness of the “clickpad” portion of the device. Like others in its class, Huawei’s converted wholesale to USB-C, with a pair of ports on the device, one on either side. There’s no Thunderbolt capabilities, however, and while the left port supports data transfer and charging, the right port only supports data transfer and DisplayPort—it’s possible that may prove annoying. One annoyance that Huawei did solve, however: The webcam now appears on top of the display, where it should be, rather than as a strange popup contraption embedded in the keyboard. 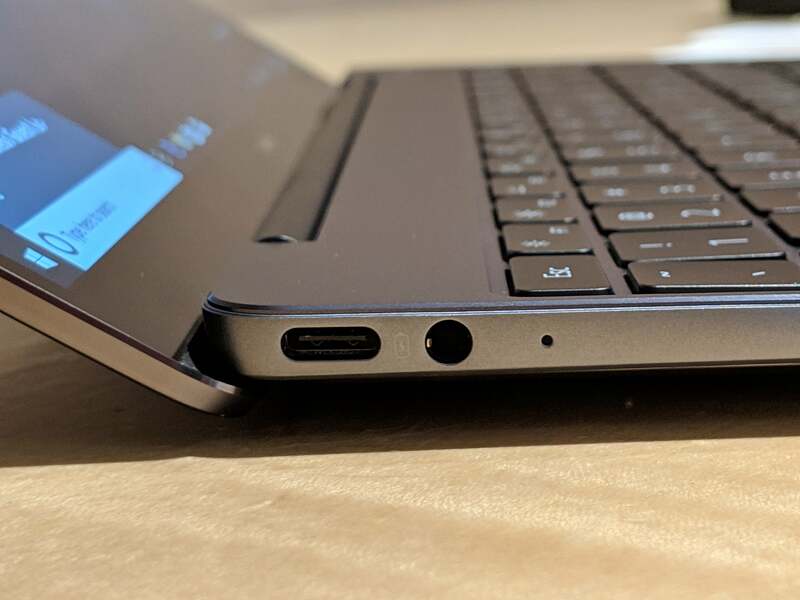 Each side of the Matebook 13 includes a USB-C port, though the capabilities differ between the two. The Matebook 13 isn’t fanless, either, though Huawei said it’s installed what it calls a “Shark Fin 2.0 system,” cooling the device by pulling air in with an 8,000rpm cooling fan and distributing it through the back of the notebook. Huawei will ship the Matebook 13 into the U.S., where it’s still a niche player. But the right mix of price and performance could help its status. We’ll want to eye it closely when we review it, though, as we found Huawei’s Matebook X Pro cut a corner or two with a special, slower GPU on top of some power throttling. Dimensions: 11.26 x 8.31 x 0.59 in.